Yadavaprakasha made a plan to take away the life of Ramanuja. He arranged for Ramanuja and his cousin Govinda Bhatta--a fellow student--a pilgrimage to Varanasi. Govinda Bhatta, being a favourite student of Yadavaprakasha, came to know of the latter's plan while they were travelling. He at once apprised Ramanuja of the danger and helped him to escape. By the grace of God, Ramanuja escaped with the help of a hunter and his wife whom he accidentally met on the way. By this time, Ramanuja's fame had spread far and wide. He became a good controversialist. Then he wrote his commentary on the Brahma Sutras known as the Sri Bhashya. The Visishtadvaita system is an ancient one. It was expounded by Bodhayana in his Vritti, written about 400 B.C. It is the same as that expounded by Ramanuja; and Ramanuja followed Bodhayana in his interpretations of the Brahma Sutras. 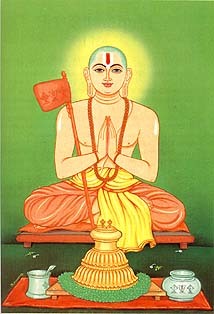 Ramanuja's sect of Vaishnavas is called by the name Sri Sampradaya. Ramanuja wrote also three other books--Vedanta Sara (essence of Vedanta), Vedanta Sangraha (a resume of Vedanta) and Vedanta Deepa (the light of Vedanta). The two unfortunate people started for Srirangam--their native place. Mahapurna was a very old man, and unable to bear the pain, died on the way. Kuresa alone returned to Srirangam. The king of the place was Bhatti Deva of the Hoysala dynasty. The Raja's daughter was possessed of some devil and nobody was able to cure her. Ramanuja succeeded in exorcizing the devil and the princess was restored to her former health. The king was very much pleased with Ramanuja and readily became his disciple and he was converted by Ramanuja into a Vaishnavite. Thereafter Ramanuja firmly established himself in the Mysore king's dominions, constructed a temple at Melkote, and created a strong Vaishnavite community there. The Pariahs or depressed classes (now called Harijans) of the place were of great service to Ramanuja; and Ramanuja gave them the right of entry inside the temple which he constructed at Melkote--on some fixed days and with some limited privileges--which they enjoy to this day. The Visishtadvaita Philosophy of Sri Ramanuja from Swami Sivananda's book All About Hinduism.